New York Times Guide to Fashion Week! This season there will be more than 100 shows taking place between now and next Thursday, followed by the same again in London, Milan and Paris until the first week of October. Fashion month has become a cultural phenomenon as globally pervasive as the ginkgo tree. You can’t avoid it, so you may as well embrace it, and find out what you should be ready to discuss during cocktail parties and water cooler conversations everywhere. Indubitably, questions of geopolitics and the stagnant European economy are more important, but think of it this way: What happens at fashion week will inform in large part the shape — literally — your identity will take six months from now. So in the interests of self-awareness (and useful banter), following is this crib sheet for what to watch, whom to know and where to focus during the collections. 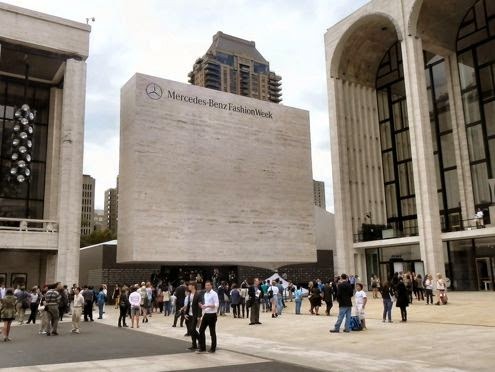 Mercedes-Benz Fashion Week is back at Lincoln Center for a select few. The crowd is smaller, and the ambiance calmer and more refined, as organizers strive to restore the event's exclusive reputation by limiting the number of invitations and sending them only to the elite. Fashion Week In New York! E X C I T I N G!